Can Bink Investment Boost Barclays’ Card Business? Should Barclays Slash Its Trading Operations? The trend of a sharp decline in equity capital market activity over the third quarter of 2018 only got worse over the seasonally slow fourth quarter, as companies stayed away from the equity market due to growing fears of a slowdown in the U.S., coupled with increased market volatility. Companies around the globe raised just $134 billion in fresh capital through IPOs and FPOs over the fourth quarter according to quarterly data published by Thomson Reuters. This compares to total equity deal volumes of $195 billion in the last quarter of 2017, and is also well below the weak $158-billion figure for the previous quarter. 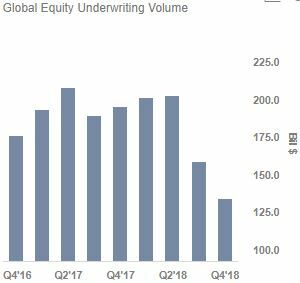 Notably, there was a sharp reduction in equity underwriting deal volumes across global regions. While deal volumes for Latin America slumped almost 56% sequentially, followed by a 30% reduction in the U.S., the declines for Asia and EMEA were muted at 10% and 2%, respectively. However, as deal volumes in the EMEA region were already substantially depressed in Q3 2018, the weak activity level hurt U.K.-based investment banking giant Barclays (NYSE:BCS) the most – with its market share falling to just 1.7%. This compares to the average market share figure of almost 4% for the bank over the last seven years, and was the weakest performance by the bank’s equity underwriting desk since at least the 2008 recession. The ensuing turmoil in Barclays’ home market of the U.K. given the uncertainty surrounding Brexit, is largely to blame for the bank’s misfortune over recent quarters. The total number of global equity issuances fell from 1,129 in Q3 2018 and the unusually high 1,712 in Q4 2017, to 1,099 in Q4 2018 – making this the slowest period in this regard since Q1 2016. With the total equity underwriting volumes as well as the number of deals falling considerably, the average deal size also fell from over $140 million in the previous quarter to $122 million for the period. Notably, as larger equity underwriting deals generate lower fees per dollar raised compared to smaller deals, a lower average deal figure is usually a good thing for investment banks in terms of the total fees they potentially generate. 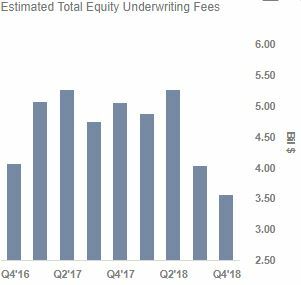 However, the significantly lower number of deals resulted in total equity underwriting fees falling from $5 billion in Q4 2017 and $4 billion in Q3 2018, to below $3.6 billion in Q4 2018. 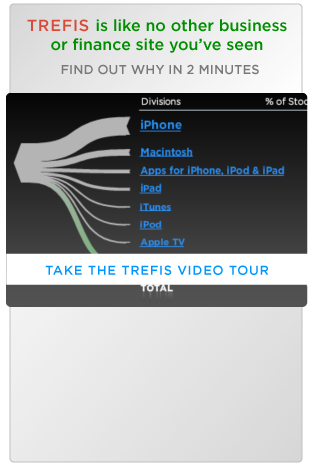 This represents a sequential decline of about 12%, and is a good 30% lower than the figure from a year ago. Notably, Barclays’ imputed fee figure is expected to be just $48 million for Q4 2018. While this is an improvement from the figure of $39 million for the previous quarter, the sharp reversal in the bank’s fortune over the second half of 2018 is evident from the fact that the average imputed fee figure for the first two quarters of 2018 was $145 million. However, as the uncertainty surrounding Brexit decreases over coming months, Barclays should gain from its strength in the U.K. equity market. We will capture the changes in market share for the five largest U.S. and European investment banks over recent quarters in a follow-up article, along with details of the expected increase/decrease in equity underwriting fees for each of these banks year-on-year and sequentially.